Here I have for sale one Lima Electric train set Donald Duck, SCALE HO. 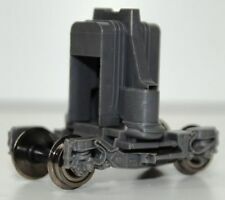 Here I have for sale one Lima Electric engine SBB CGG 10050, SCALE HO. The engine has few signs from the years. Without buffers. It runs very well. Here I have for sale one Lima Diesel engine 270 023-5, SCALE HO. The engine runs very well. It runs on three rails systems. Lima SNCF French Railway. The engine for this set (item 1004) was tested and it works fine. Set includes two matching cars, item numbers 1005 and 1103CL. 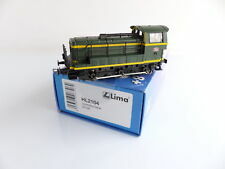 Here I have for sale one Lima Electric engine 111 004-8, SCALE HO. It runs very well. Wonderful Electric Locomotive Photographs in great condition. Condition: in good condition / see Photos. Engine runs good in both directions, headlight works. Excellent condition, original box. Lima HO South African Railways SAR E444 THE BLUE TRAIN LOCOMOTIVE & 3 WAGON Set! Condition: Top Mint Contents! Super Rare Loco Passenger Wagon Set! The Loco and coaches appear to have been unused or test run only! No discoloration to both box and contents! An incredible find. Lima HO 1:87 Italian FS Type E-645 "2-Section" Electric Locomotive Hull Mint`75! Straight from the Lima factory! -Condition:100% Top Mint Model Loco Hull. All original. Top Mint and Unused, Factory Fresh Hull! -Scale:1:87 HO. Enjoy the benefits of DIVANDO! We hope you will enjoy this new find! 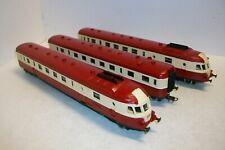 3x "SILBERLINGEN" INOX Passenger Wagon Gift Set. -Condition:Wonderful Gift Set! The Loco is the famous, Heavy German Diesle Model type: BR V-280. Used for both Goods aswell as Passenger Trains! Very nice looking, Complete with the Original Tail-Reverse drive wagon! Looks like engine has been repainted and decorated - see pictures. Very Nice, Finely detailed engine. P lease see detailed photos. The item you see is the actual item you are buying, unless there are multiples for sale. Further, old plastic tends to get brittle & especially withTOYS, can break easy under 'typical' use. What you see is what you are buying. Here I have for sale one Lima Diesel engine 218 218-6, SCALE HO. It runs very well. Lima HO South African Railways SAR Brown E919 ELECTRIC LOCOMOTIVE NMIB TOP RARE! Condition: A Super Rare Loco! Wonderful and Very Rare, Less seen South African Railways Locomotive! You will love it! These SAR Locomotives are becoming harder and harder to get. Near mint, Hardly any sigsn of use and very slight wear here and there, nothing much or serious. Strong and powerful locomotive. Very good condition, little scratches. 3-Unit Railcar DB 118-0. LIMA HO Scale 430 Class. 13944 Willard Rd. Single motor. Lima HO 1:87 French SNCF RGP "PARSIFAL" X-2780 3-Piece TEE MULTIPLE UNIT MIB`70! Scale:1:87 (HO Model train Lay-Out scale.). -Condition:100% Top Mint! Hardly used if ever! TOP Condition! The boxes look good, the innerboxes are like new, the overal gift set box shows slight wear and a large corner tear. Renfe is the modern, extensive and efficient railway system that makes train travel in Spain delightful. The AVE, the Spanish High Speed rail line, has made long distances shrink over the years. The second high-speed rail line that Renfe operates from Madrid to Barcelona was completed in 2007. Lima HO South African Railways SAR E341 "THE BLUE TRAIN" LOCOMOTIVE NMIB RARE! Condition: A Super Rare Loco! Very Good Condition. This "Blue Train" South African Luxury Train Locomotive belong sto the rarest ones made by Lima. That's all. The original Cowcatchers are presetn. Here I have for sale one Lima Diesel engine SNCF 501, SCALE HO. The engine has few signs from the years. It runs very well. Rare vintage Lima N-SCALE diesel engine EMD F7. Chesapeake and Ohio 4012. very good condition. Runs great. no original packaging. Condition:100% Top Mint Condition! Maybe testrun only! Detailing parts not applied,s till on the sprew! Simply Close to C-10! Can`t find one in better shape! You will love it. Hard to find! A wonderful addition to your Austrian ÖBB railway lay-out collection! The item you see is the actual item you are buying, unless there are multiples for sale. What you see is what you are buying. Lima HO 1:87 German DB Heavy V-300 DIESEL LOCOMOTIVE + Acc. Top Detailed MIB`95! DB BR V-300 Heavy Duty Co-Co (6-6) Diesel Locomotive! -Condition:100% Top Mint Locomotive, hardly used if ever! Bright and shining, not a scratch or any kind of wear. Testrun only! The detailing parts are present and where not applied! Made by LIMA in Italy. You are only getting whats in the photos, nothing else, nothing more, just what you see, If you don't see it your not getting it. No Matter What. A google check is usually the best way to find out if the software will run on your computer. Lima HO 1:87 USA "THE SPIRIT OF 1776" ALCO CLASS C 420 Diesel Locomotive MIB`78! Condition:100% Top Mint Model Loco! A wonderful and less seen model! No discoloration and no play wear ofcourse. A wonderful Locomotive for the USA Railways Die-Hard! Shortly made. Hard to get! État : Occasion. Loco motrice électrique Lima BB 9276, échelle HO analogique des années 80/90. Motrice seule, sans boite. Pantographes ok.
Modèle analogique Installé un connecteur à 8 broches pour le décodeur. You are looking to buy the Lima based 0-4-0 diesel shunter shown in the photo. The gauge is oo/ho in O gauge scale so is On30 or O gauge narrow gauge.